Formula One’s American broadcast will be on ESPN next year, which people are understandably apprehensive about. But in some good news, F1 may push back start times, allowing we of the Red, White and Blue to sleep in past 6:30 a.m. on the weekends. On a lazy Sunday morning, that’s a decent consolation prize. Motorsport.com reports that F1’s new American owners could push back start times by an hour for most events this race season, citing sources who were at a meeting with television broadcasters and the owners at Liberty Media last week. 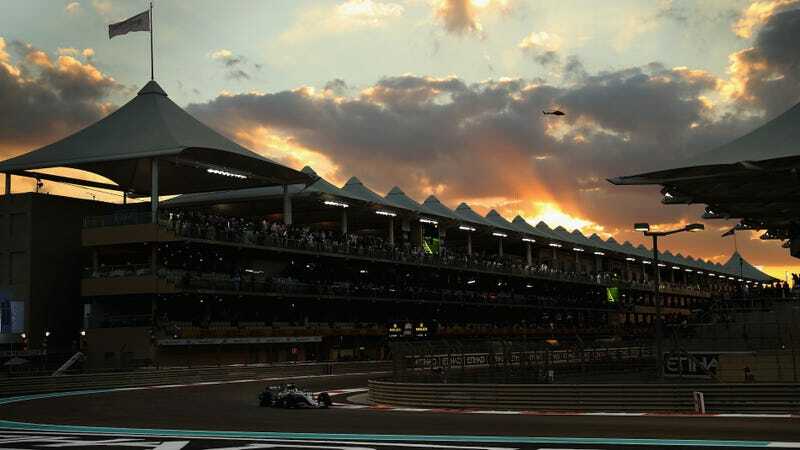 F1 travels worldwide and has a worldwide audience, making it hard to line up start times with fans in different hemispheres from any given race. Pushing back start times could help or hurt the efforts, depending on where a fan is. This would mean typical European races would move away from the traditional 2pm start slot that they have held for decades. Furthermore, there is the idea to move the races back a further 10 minutes – to start at 3.10pm – to help better fit with commercial television channel coverage, especially with the American audience and the need to run adverts before the start. F1 representatives were not available for comment to confirm the latest situation regarding the potential change, but it has emerged that scope to alter the timetable in such a way has been opened up by tweaks to the F1 rules this year. The goal for pushing start times back is, obviously, to get a bigger television audience tuning in. It would particularly help U.S. viewers, since it feels like almost every F1 race that isn’t on this side of the globe has a start time at or before 7 a.m. on Sundays. While F1 didn’t confirm anything to Motorsport.com, the website reports that the sport’s regulations have changed: They no longer say practice and qualifying sessions have to start at specific times, only that the each session needs to be spaced out by a certain amount of time. The report also said the start time for the French Grand Prix could be moved back to 4:10 p.m. local time, as to not compete with a World Cup game going on that day. That’s probably a good idea. From the standpoint of a greedy, cranky American who just wants a little sleep on their Sunday morning, this sounds like it could be a good move. After all, there’s no 5 o’clock traffic on Sunday and everybody loves a little extra time for pre-race wandering on the big day. But you know how F1 is about good ideas—they have them, get us all excited for them, and then they banish them forever. Don’t get your hopes too high, fellow Americans. It’ll just make you crankier when it doesn’t happen.